↑ ၃.၀ ၃.၁ "Trigonometric Parallaxes of Massive Star Forming Regions: VI. Galactic Structure, Fundamental Parameters and Non-Circular Motions" (2009). Astrophysical Journal 700: 137. doi:10.1088/0004-637X/700/1/137. Bibcode: 2009ApJ...700..137R. ↑ "Distance to Orion KL Measured with VERA" (2007). Publications of the Astronomical Society of Japan 59 (5): 897–903. doi:10.1093/pasj/59.5.897. Bibcode: 2007PASJ...59..897H. ↑ "Nebula". The American Cyclopædia. 1879. 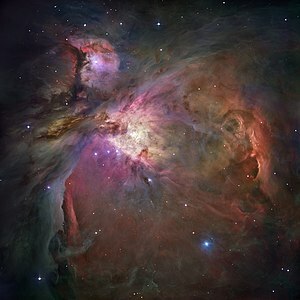 ↑ Press release, "Astronomers Spot The Great Orion Nebula's Successor", Harvard-Smithsonian Center for Astrophysics, 2006. ↑ "Preliminary Study of the Orion Nebula Cluster Structure and Dynamics" (1998). Astrophysical Journal 492: 540-553. doi:10.1086/305076. Bibcode: 1998ApJ...492..540H. Computer visualization of Orion Nebula.